Switch widget (acts as a multiposition switch, that when clicked will cycle through different values/images). You can now set the progress bar base colour, and the gradient colours will be calculated dynamically. This ability is thanks to work done by ijwelch! You can now add markers to the progress widget. UPDATED Sparkline widget. A great charting widget created by ijwelch. Thanks again Ian! There are now 3 distinct styles for the Sparkline widget. NEW BulletGraph width. Another amazing widget by Ian (ijwelch) . LATEST SOURCE AND SCREENSHOT IN MOST RECENT POST - I CAN'T ADD NEW FILES/IMAGES TO THIS POST ANYMORE? I welcome any bug reports, questions, and comments. If you have any ideas for new widgets, I would like to hear about them. Enjoy! Thanks joeliner, I hope you can find some use for the code! Updated with new Progress widget. I tried to do a reasonable approximation of the CJ progress bar in Office2007 mode. I don't find option in code to add number on the top of progress bar. E.g. how to show 45%? The first post in this thread has the latest update source and EXE demo. I've got an idea that would be nice to implement for the Progress widget, but I was hoping somebody with graphics/colour blending experience could help me out. It would be cool if we could pass a colour (#xxxxxx or Long) and the widget would base its gradient values on that colour. This would make it easy to change the colour of the progress bar (for example, if there was an error in processing, you could change the colour to red and the gradients would be updated accordingly). The average colour for the entire "green" portion of the progress bar is #99c753. What would be great is if a user could pass the average colour, and the rest of the gradient stops (as listed above) would be computed automatically. So, is there anybody out there who has some ideas on how this could be accomplished? Mark, I just saw the edit to your earlier post (mentioning # over bar). Did you see the latest source? You should now have a property of the CUiProgress class called ShowPercentage (can be showpercentagetype_OnBar for display on progress bar, showpercentagetype_ToolTip for display as a tooltip on mouse hover, or showpercentagetype_None for no progress percent display). No - I don't find it - may be my download was older? Sure it was - new had extra 3 KB and I see % on just run - without modifications. I like it! I just checked the latest source in the top post of this thread, and it appears to have the new properties...maybe you need to download it again. I'll always keep the latest source in the first post in the future as well. Hey Aaron, it's good to see you back (for a while I hope )! I'm glad you liked the demo. experience could help me out. gradients would be updated accordingly). Thanks to the work done by ijwelch, I have updated the demo (see top post for newest source) to include the ability to set the progress bar colour. Thanks again! btw Jason: I would like to draw triangles or squares (are setpoints) in the progressbar like the image below, is this possible? Hey Aaron, I don't see the triangle example image...did you attach it? Re: docking pane - I haven't used the docking pane yet, but my guess would be that perhaps the pane causes the RC to refresh/repaint more often for some reason? This could be slowing things down and causing the unresponsiveness...Just a guess though. The sample I used was from Ian's post in XAML subforum. If you select a gray(ed) color from ColorPicker it does paint red markup gradient. With your sample I tried RGB(128,128,128) , if I'm not mistaken this is gray, and it does draw gradient in gray. Here's new version of xamlBar function from CUiProgress class. Now handles grayscale colors. xamlBar = "<StackPanel Orientation='Vertical' HorizontalAlignment='Left'>"
xamlBar = xamlBar & "</StackPanel>"
Hey Ian - thanks a lot for that updated color code. Aaron - I have modified the code to cache a number of strings in the CUiProgress class to see if that will speed things up (maybe you could try it out with the DockingPane again?). Not sure if it will make any difference, and I also may have caused some problems here (particularly if I forgot to mark the class dirty under circumstances that would require the strings to be re-created with new values). I've also added support for triangular-ish markers. I've tried to give them a 3d-ish appearance, but I'm sure that they could be made to look nicer. Anyway,give it a try and get back to me if there are any problems (new source will be in top post momentarily). Aaron - regarding the charts in ReportItems. In theory it is possible (in that you can use any markup in the RC now AFAIK). The problem is that my chart demo uses the MarkupLabel objects instead of markup strings. AFAIK, the RC only supports markup via strings (in the caption property). It would be a fair amount of work to convert my demo to a strings version (so I will leave this to another enterprising soul). What would be nice is if each ReportItem could have its own MarkupUiElement object and we could add markup objects to it (as with the MarkupLabel). Then code would be re-usable in both components. Aaron - regarding the charts in ReportItems.In theory it is possible (in that you can use any markup in the RC now AFAIK). The problem is that my chart demo uses the MarkupLabel objects instead of markup strings. AFAIK, the RC only supports markup via strings (in the caption property). It would be a fair amount of work to convert my demo to a strings version (so I will leave this to another enterprising soul). What would be nice is if each ReportItem could have its own MarkupUiElement object and we could add markup objects to it (as with the MarkupLabel). Then code would be re-usable in both components. Very cool Ian, thanks a lot! I will try and get your code added to the demo today! Unfortunately, I can't edit the top post anymore, so I will be posting updates as they arrive in new posts. Aaron - did caching some of the Progress UI strings help with the DockingPane clicking problem? If not, can you post a sample with the DockingPane so I can see if I can figure out what the problem is? Thanks. I'm caching the markup strings as much as possible to be more efficient. The Progress widget now properly handles being in a resizable column. Added some more comments to hopefully make things clearer. I've also attempted to animate the Sparkline widget using a timer. This works, but even with all of the efficiency improvements, interaction with other widgets (e.g. clicking the Switch widget) becomes fairly unresponsive while the timer is running. It often takes 2 clicks to get the value to change. I would be very interested in any ideas on how to improve the efficiency in this area so that the responsiveness stays high. Maybe we need the ability to control RC Redrawing at a finer level? Say a LockRedraw property and RedrawRecord and RedrawRecordItem methods? I've just had a thought that perhaps I can turn off custom drawing at key moments and maybe that will speed things up...I'll give it a try. So if you are ever in Ian's neighbourhood, you had better stop by and buy him a beer! My problem with clicking switch / attribute widget isn't dockingpane related, I did test (only with 1 pane) and it works fine. If you are going to use sparkline widget and set timer to less than 100 it doesn't always fire event but this is understandable hehehe. So I have to search problem in other controls as well. Trying to understand how it all works is beginning to get a problem because my Markup knowlegde is very low I need to upgrade my knowlegde to keep up with you guys (I know I said this several times but now I have to...) just to understand what is going on in your classes. In sparkline class I get lots of errors <divided by zero errors> in pCalcPoints where some margin is calculated ??? Is this with the current code, or with modified code where you have changed the Margins? I haven't seen any DivideByZero errors yet. If it's modified code, can you post it? Sometimes when you start timer and will start changing values the markup "jumps" to other values. I don't know why it happens but I noticed it several times. I haven't seen this either...do you mean that the whole sparkline changes every value? Or is it just jumping more than 1 shift to the left? Do you mean a gradient & lines to cover the entire report background? or individual gradients and lines for each report item/cell? I think it would be quite difficult to cover the entire report background because you would have to do a lot of calculations for when the form or columns are resized. Something that would make this easier is if the CJ RC had a BackgroundMarkup property that allowed you to set markup that would be drawn first, and then the rest of the report could be drawn over top of it. Okay, I just saw your picture (it wasn't appearing earlier), and I see you are drawing the gradient/lines on a per cell basis. So the problem is just the height of the gradient/background compared to the height of the progress bar? This should be easy enough to correct by adjusting the HeightPx value passed to the Sparkline control. Can you post your gradient code modifications so I can try this? It would be nice is someone from Codejock could comment on the responsiveness issues (when clicking items) with the demo app. It seems that the more markup cells that we add, the worse things get (even without animation). I've tried to optimize the code as much as possible through caching, marking classes as dirty (so updates only occur when changes have been made) and by using a high speed string builder class, but it still seems that markup cells only respond to mouse events every couple of clicks now (not to mention the mouse icon keeps reverting to the default arrow instead of staying as the Hand icon when clicking on markup ui elements). I can only guess that this is because we are adding more and more Markup UI elements to the ReportControl. Is BeforeDrawRow firing too often/unnecessarily? My code does attempt to catch some unnecessary firings (e.g. when Width/Height of ReportItem is 0 pixels, why does it fire then?). If it is firing unnecessarily, can this code be optimized in CJ source to only fire when absolutely necessary? Maybe we need the ability to be able to redraw a single ReportItem instead of having to call Redraw for the whole ReportControl? That way, if only one item has changed we aren't wasting resources redrawing the whole control. Or is there already a better option for redrawing after markup updates? Why are the MouseLeftButtonDown and MouseLeftButtonUp markup events becoming completely unresponsive at times? Even with a click sometimes the corresponding sub in the VB6 code aren't being fired. Is this because the markup context is being destroyed and rebuilt during Redraw or something? Does it make sense to somehow cache clicks so that when the markup context is recreated, the clicks get sent? A short delay is better than no effect at all in my opinion. Is it possible to add MarkupContext and MarkupUiElement classes to the ReportControl & ReportControlItems respectively so we can use the (presumably faster) class approach to markup programming (like the MarkupLabel) instead of the slow and painful string approach? This would also allow for completely reusable code between those two controls. In fact, while I'm dreaming, why not add MarkupContext/UiElement to all controls that support markup? It is a vastly superior method (again, in my opinion). I must say that it is bothering me that Markup for the RC and MarkupLabel hasn't seemed to be getting any further enhancements in a long time. I think it is easily one of the best features of your products (if not the best), as it opens up so many new possibilities for our software. I think the work that Ian and I have done on the RC UI widgets demonstrates just how much potential there is in this area. I would be interested in hearing what other CJ customers think of the Markup features, because maybe I am alone in this thought (which would explain why markup is being largely ignored lately, or it least why it is not being developed to its full potential). Thanks in advance for any comments on these issues. Aaron: In sparkline class I get lots of errors <divided by zero errors> in pCalcPoints where some margin is calculated ??? Jason: Is this with the current code, or with modified code where you have changed the Margins? I haven't seen any DivideByZero errors yet. If it's modified code, can you post it? Aaron: Sometimes when you start timer and will start changing values the markup "jumps" to other values. I don't know why it happens but I noticed it several times. Jason: I haven't seen this either...do you mean that the whole sparkline changes every value? Or is it just jumping more than 1 shift to the left? Do you see height of area on left side? strLinesVertical = strLinesVertical & "<Line Stroke='LightGreen' StrokeThickness='1' X1='" & (m_WidthPx / 100) * i & "' Y1='0' X2='" & (m_WidthPx / 100) * i & "' Y2='" & m_HeightPx & "' ></Line>"
strLinesHorizontal = strLinesHorizontal & "<Line Stroke='LightGreen' StrokeThickness='1' X1='0' Y1='" & (m_HeightPx / 100) * i & "' X2='" & (m_WidthPx) & "' Y2='" & (m_HeightPx / 100) * i & "' ></Line>"
As for the "jumping" problem, I believe that this is by design. It appears that the Sparkline widget dynamically adjusts the display to accomodate the min/max value. So when everything is the same value, you get a flat centered line, but as soon as other values start being introduced to the array of values, the Sparkline will calculate the best fit for the maximum value, and in the case of suddenly appearing negative values, the zero line will even be bumped up to the middle of the chart. This ensures that all values are always optimally visible. It should be possible to add HardMin and HardMax properties though and skip the dynamic calculations. This could be useful where you know you values will always be within a range of numbers and you want to ensure that the chart scale always remains the same. Lastly, if you play with the margins for your Border tag and adjust the Y1/Y2 properties for your lines, you should be able to get the background image to appear at the same height as the progress bar. Don't use m_HeightPx + 20, because that would likely move the bottom of your grid outside the bottom of the RC row. I haven't had time to mess around with this too much, but I will try to get to it later. KILLED LONG CODE BLOCK - NEW UPDATE COMING SOON! Well I must be a little bit crazy, or else just a good (bad?) procrastinator (actually, this work is teaching me a lot, so it has been useful and not just fun). I've taken some time to improve the demo once again by adding a CGridBackground class (including Gradient, SolidColor and NoBackground styles). This class includes CGradient (for controlling gradients) and CGridAxes (for controlling gridlines) classes. It could still use some improvement (border colour for the background comes to mind), but it is certainly usable right now. Note that you can control the gradient colours & stops and the grid line colours & visibility, the above is just a sample. That chart background looks good. Nice one. Anyone have any ideas for improvements or new widgets? The StopColors aren't working for me. If comment these lines your sample works. To Ian: The issues I mentioned (in previous replies) are still a problem, maybe you have an answer to these problems? 1) What's not working about them? Are you getting errors? They seem to be working here. 2) What lines did you comment out to get things working? 3) Were you using different colours than the ones in the demo, or a different number of stops? Just wondering if the problem lies there. Regarding the problems you were having with the sparkline, the latest source should have fixed the divide by zero errors, are you still getting them? Are you sure that you have the latest code (my most recent post with a link- unfortunately I can no longer add new file attachments or images to the top post)? Same problem in the EXE? Did you make any modifications to the code? 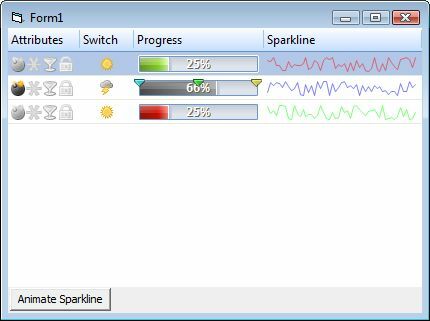 I've just re-downloaded and all of the sparklines are being drawn in source and EXE. The first sparkline is only showing markup string in reportitem like Mark said. Strange...I'm now using the latest 13.2 beta (I think it's the latest) and I am noticing some strange problems. The demo seems to work fine at startup, and if I resize the form, everything works as expected. If I then re-order columns or re-size columns or even just click the grid and then resize the form, then I get the raw markup strings. I'm reasonably certain this wasn't happening before, but I will have to do more checking to see if the problem is with the markup control or with my markup strings. I'll get back ASAP. Mark, could this problem be related to the recent fix to the X mouse icon (disabling markup)? Now with the demo, if I click any of the Attribute or Switch icons, the cell switches to raw markup text...I can't think of anything that I would have changed recently that would result in this, but I will keep digging. Okay, there definitely seems to be a problem with the ReportControl (13.2). If you click a Markup item that has an event associated with it, you only get 1 click before markup gets disabled. If your markup string is static, then the markup will continue to be rendered, but it will be unresponsive. If your markup is dynamic, then you will end up with raw markup strings. .Caption = "<Border Cursor='Hand' MouseLeftButtonDown='LeftMouseDown' Background='Blue'><TextBlock Text='Static'/></Border>"
.Caption = "<Border Cursor='Hand' MouseLeftButtonDown='LeftMouseDown' Background='Blue'><TextBlock Text='Dynamic " & Me.Width & "'/></Border>"
Item.Caption = "<Border Cursor='Hand' MouseLeftButtonDown='LeftMouseDown' Background='Blue'><TextBlock Text='" & Me.Width & "'/></Border>"
If you click a static column, the markup will become unresponsive after the first click. 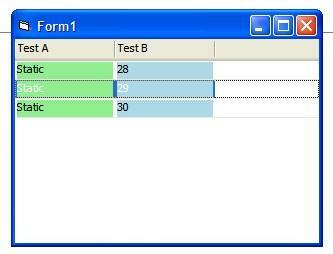 If you then resize the form, the dynamic column will show raw markup strings. This definitely was not a problem with an earlier beta. Cannot convert string in attribute 'Offset' to object of type 'CXTPMarkupDouble'. Line 1, position 227First-chance exception in VB6.EXE (KERNEL32.DLL): 0xE06D7363: Microsoft C++ Exception. Hi Mark, thanks for the catch...I will take a look at that problem once the disabled markup problem is fixed (or perhaps Ian can figure it out easier since it is his code). Okay, well its related to something, that was just a guess since I only see problem in the latest 13.2 that I have. Did you try the small test case code that I posted? Doesn't work for me. I've download the OCX at the link provided, renamed, re-registered - used both your sample and mine, same problem as described. There is still a possibility that the problem is with my OCX, but it is difficult to tell 100% what version I am running. The About screen show 13.2, but without a revision # or date on that screen, how do I know 100%? I wish you guys would put a build number or show the file date and time on the About window, it would save a lot of headaches when beta testing. I don't understand what the problem is - is it that I have an older Markup OCX? I didn't realize that the RC and the Markup OCX were dependent on each other? Or do you have a more recent RC version with newer internal markup that hasn't been built yet? Still broken for me. I tried going back to an older 13.2 (doesn't have .PaintManager.GrayIfDisable property) and the code works as expected. I then retry the latest OCX (Sep16 @ 4:21PM) from the link provided above, and I get raw markup. I've tried this on Vista and Win2K, same problem. I downloaded beta OCX and registered it. Opened existing project Jason created and on startup all seems "normal"... Resizing form will resize columns and also (because I have AutoColumnSizing = True) also works as expected. Once a different row is selected and resize 1 column manually all Markup is broken except the attribute and switch widget column. 1) Start VB6 fresh (no other open instances, start from scratch). 2) Open and start (F5) the RCMarkupUI project and click one of the attribute icons. Raw markup appears. 4) Restart (F5) the project and click one of the attribute icons. The icon will switch states as expected. 5) Try clicking another attribute icon on the same row. Nothing happens, markup events are now disabled for that cell. 6) Try clicking another attribute icon on a different row. The icon will switch states as expected, and then markup events will be disabled for that cell as well. If you subsequently close VB6 down completely and restart, all of the steps above are 100% reproducible. I don't think that I have ever seen state held between subsequent starts of a project in the IDE before! Can you reproduce this? I debug it and found that effect related to enable - disable markup. I see trace of Enable Markup after X-icon disparead but I guess inside item markup context is not valid now as it related to obsolete markup context of control - and control created new one! Also, should you only be destroying the markup context when the mouse is down on the header (before a column drag), and not when the mouse is down over the report area? Just thinking out loud...but the markup event responsiveness is worrying me. Lastly, I also notice that there are as many as 6 BeforeDrawRow events fired for a single mouse down...why so many? Are they necessary? It seems like this could really be affecting performance when markup strings are involved. I think we should forget about EnableMarkup function - looks like it not designed to toggle. Please ask Oleg to fix the problem on Markup component level as I proposed in very beginning. Okay, I will open a ticket for Oleg. Can you rebuild without the enable/disable markup code so that I can create a test case for Oleg? Sorry, I missed your post. Will test now. Just retested the RcMarkupUi sample, and it seems to be behaving like it used to now. I haven't seen any raw markup text, so that is good news. Okay, I now understand why the BeforeDrawRow event was firing 6 times on a single mouse down - it fires for each visible row and column, and my sample had 2 columns and 3 rows. Is there a way to optimize the BeforeDrawRow event to only fire for the single cell that was clicked? Or is this a bad idea? I could image that maybe it needs to fire for a whole row if the selection is changing...but it seems excessive to always fire for all visible cells in all circumstances. Guys - you aways asking about this infinite notifications which definetely slow your app down. BeforeDrawRow do it's job and there is no BeforeDrawCell function and developer want to use fancy individual shape for each cell. Can you improve your respond function to return immedeately if no action need? Kidding aside, I'm only wondering if it everything is working as fast as it can. In my RcMarkupUI demo, I am caching strings, and short-circuiting BeforeDrawRow when no changes have been made to the underlying markup (as you suggest) in order to try and speed things up, but it is still slow to respond to click events. In the very simple demo I posted above, there is really very little going on markup-wise, and it is still slow to respond. So, if this is indeed as fast as it gets, that's good to know, but it does mean that interactive markup is not really going to be useful in the real world. That's fine if that's the case, I am just wondering if this is the case, or if there are inefficiencies in the current design that can be improved. You mention that BeforeDrawRow is doing its job, but I'm arguing that it is over-doing its job - why should BeforeDrawRow fire for rows that haven't been affected by anything? If a user clicks the mouse down on Row 2, why should BeforeDrawRow fire for all of the other visible rows? Maybe there is a good reason, I don't know, that's why I am asking. If there is no good reason, then maybe this is an area for optimization? Also, even though you say there is no BeforeDrawCell, BeforeDrawRow sure seems to behave more like BeforeDrawCell than BeforeDrawRow (note that it has Row and Item parameters, which essentially correspond to a cell when combined). In any case, I'm not convinced that the problem is with BeforeDrawRow...Here's an updated sample that only tries to dynamically update the first cell when the user clicks it...every other cell is short-circuited at the top of BeforeDrawRow. The click response is still not very good (often only every other click responds). It almost seems the the MarkupContext or handler is being destroyed and recreated each click for the RC, so there is a short period where the handler isn't available and the clicks don't register. The fact that the mouse cursor flashes to an arrow temporarily (instead of always remaining a hand icon) seems to support this theory. Compare this to the MarkupLabel hand icon that is always steady. Because BeforeDrawRow event fires on MouseDown and MouseUp clicks (I don't know why this is necessary but it does ?!?!) Your clicking on (for example Switch item) are updated in between. Meaning BeforeDrawRow event already updated Switch reportitem but "didn't know" that value of icon had to be changed (value didn't change yet?) Forcing RC redraw will update the switch reportitem. Add Me.ReportControl1.Redraw in mo_MarkupEvents_SwitchClicked event. Run project > Now you will see the icon gets updated (if you have a lot of items you will see that items get updated a little slower) but at least it's updated... If you comment the .Redraw the item gets updated if you force RC to fire BeforeDrawRow event > so just using arrow down to select next row will do this. See? Previous row gets updated. Hey Aaron, thanks a lot for looking into this too. The Redraw method is a promising lead - I may have actually had it in a previous version, but I think I took it out because things seemed to be working without it (I guess I was wrong!). I haven't tried it yet, but I will, so thanks a lot for that information. I hope we can get the speed improved, because the RC will be an even more powerful tool with responsive Markup events, and I look forward to seeing your widget contributions! It does seem like Redraw is a bit wasteful in this case (I assume that it redraws the entire ReportControl)...Mark, would a RedrawCell method be possible with the current architecture, or are we stuck with a complete control redraw only (or maybe behind the scenes the Redraw method is "smart" and only redraws what is necessary already?). And Mark, thanks for the code snippets - I'm not sure what I'm look at yet ;) but I will look it over and see what I can understand. If the Is_X_Cursor property = TRUE, then I can set the markup cursor to None and the X cursor remains visible. 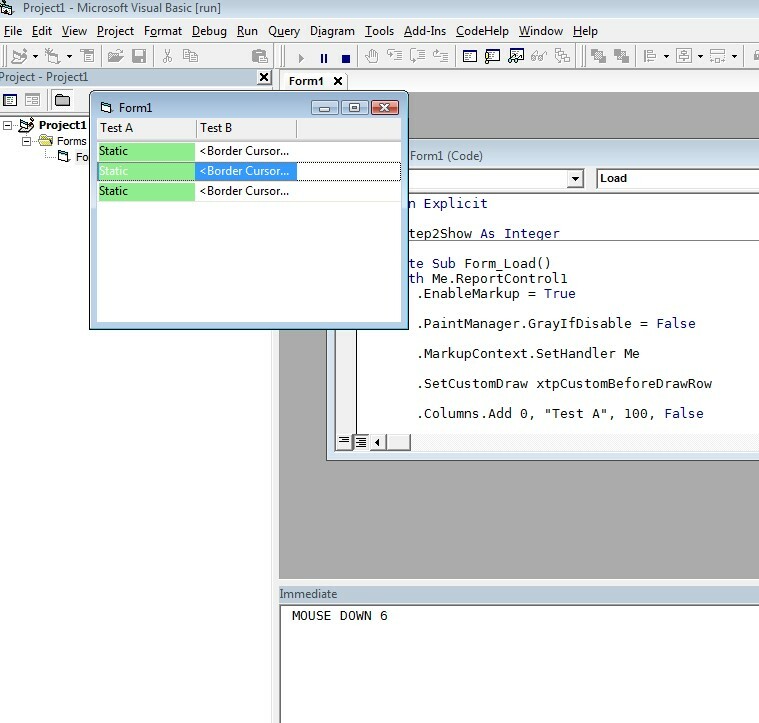 1) By default, markup object cursor appears to be set the Default instead of None. This means that I have to explicitly set the Cursor='None' attribute for every single markup tag (otherwise the Default/Arrow icon overrides the X icon)! 2) I now will also have to track which tags need special icons (say the Hand icon) and switch the markup strings manually based on the Is_X_Cursor property. 3) There is no event to know when dragging a column has started and ended, so it is more complex than necessary to swap the Cursors currently. I could probably do all this in the Mouse* events, but it starts getting really ugly, really fast. 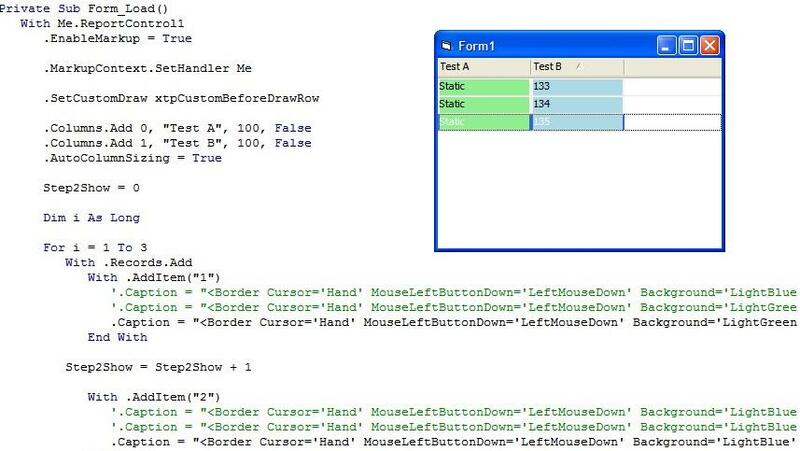 It seems to me that the simplest and cleanest solution would be for the Markup core to have an IgnoreMouse property, and then the ReportControl could set that internally when the X cursor changes. It could be useful in other situations to (like drag & drop). Actually, I just tried enabling drag and drop in my sample, and when dragging columns the Markup cursors are completely ignored by the ReportControl. How is this being achieved, and can it be extended to the column drag cursor? Jason please be more precise - are you use ReportControl_X in this case or previous version? Are you mean rows in this sentence "when dragging columns the Markup cursors are completely ignored"? It has Drag & Drop enabled, and if you start dragging a row, the markup cursor does not over ride the drag & drop cursor. However, if you try dragging a column header, the markup cursor does override the X cursor. So maybe there is a clue here? How does the D&D cursor remain steady while the X cursor doesn't? Can whatever method D&D is using to maintain its cursor be reproduced by the X cursor code? Well it easy to calculate how many times this will fire when you have 20 rows visible . To Mark: Why does MouseDown/Up (and some other keys) fire BeforeDrawRow event? Even when there was nothing changed? I'm curious though how this will work with V12.1 where Metrics supports Markup. I remember I did a test once with extendable Tooltips and used Metrics.Text for Markup. Mark, just to help, don't be offended by this. Aaron: BeforedrawRow event is overdoing it's job... Some of the actions like a mouse click on a row? Maybe you need to look into this to diminish the number of events. Fire only when really needed...??? Aaron: Look at some of my replies in this thread where I summized the number of fired events. This is definitely slowing down our app. and this has been proven by DEMO of Jason, right? I really hope other members are willing to discuss this also. I created a new thread (https://forum.codejock.com/forum_posts.asp?TID=15387) because this post is about something else, right?